"I am my own electric company," the homepage of solar company Sunrun reads. Many traditional electric utilities fear rooftop solar—despite its minimal market share—for this very reason. Customers are quickly realizing “they don’t need the power industry at all,” notes David Crane, CEO of NRG Energy. Perhaps more frightening for utilities is the fact that the solar industry is growing at an astonishing rate. It may be small now, but as companies like Sunrun continue to seduce customers, rooftop solar is quickly becoming an existential threat to the traditional utility business model. Take a look at the numbers and charts below to see how fast solar is growing and why it could upend the electricity business in the near future. 80 minutes: Amount of time between U.S. solar photovoltaic (PV) installs in 2006, GTM Research reports. 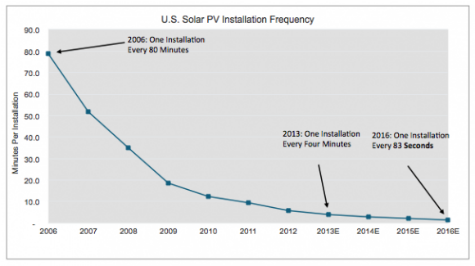 4 minutes: Amount of time between solar PV installs in 2013, GTM reports. 83 seconds: Amount of time between solar PV installs in 2016, GTM projects. 5,000: The number of residential net-metering customers in the U.S. in 2003, according to the Energy Information Administration (EIA). 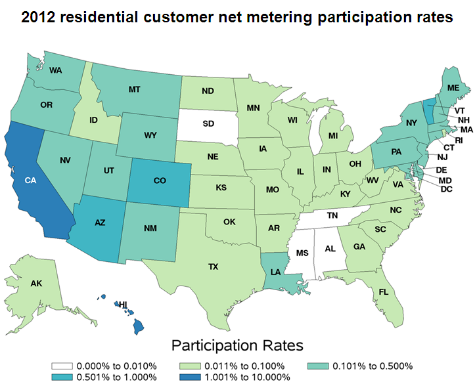 297,000: The number of residential net-metering customers in 2012, the EIA reports. 76%: The percentage PV solar installs increased over 2011, according to the SEIA. 90,000: The number of home and business owners that installed rooftop solar systems, totaling 1.15 (gigawatts) GW in 2012, according to the SEIA. 488 MW: Amount of residential PV solar installed in 2012, representing a 62% growth compared to 2011, according to the SEIA. 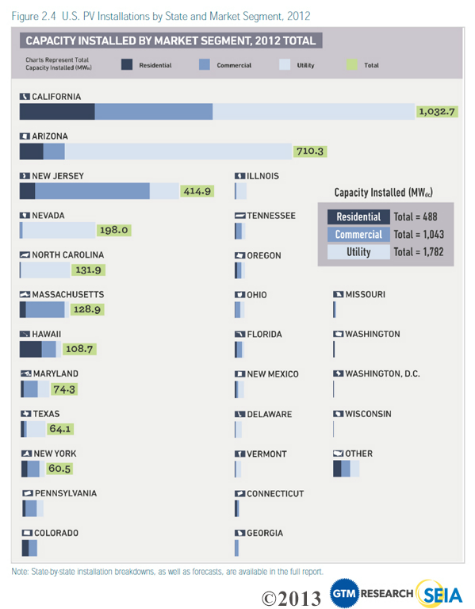 7,221 MW: The cumulative amount of installed solar PV capacity in the U.S. by the end of 2012, the SEIA reports. 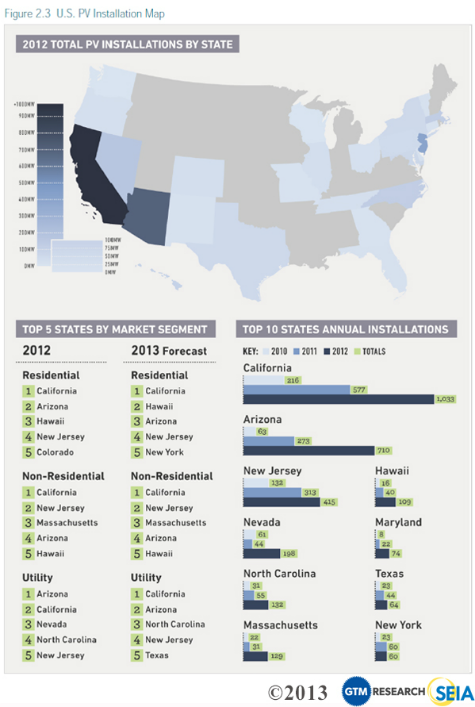 1,033 MW: Amount of solar capacity installed in California in 2012, the most of any U.S. state, according to the SEIA. 15,000 MW: Amount of installed buildings sector solar PV distributed generation by 2015, according to an EIA projection. 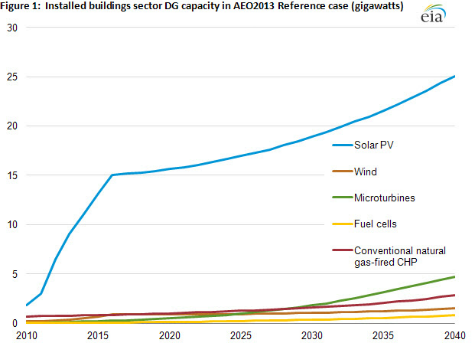 25,000 MW: Amount of installed buildings sector solar PV distributed generation by 2040, according to an EIA projection. 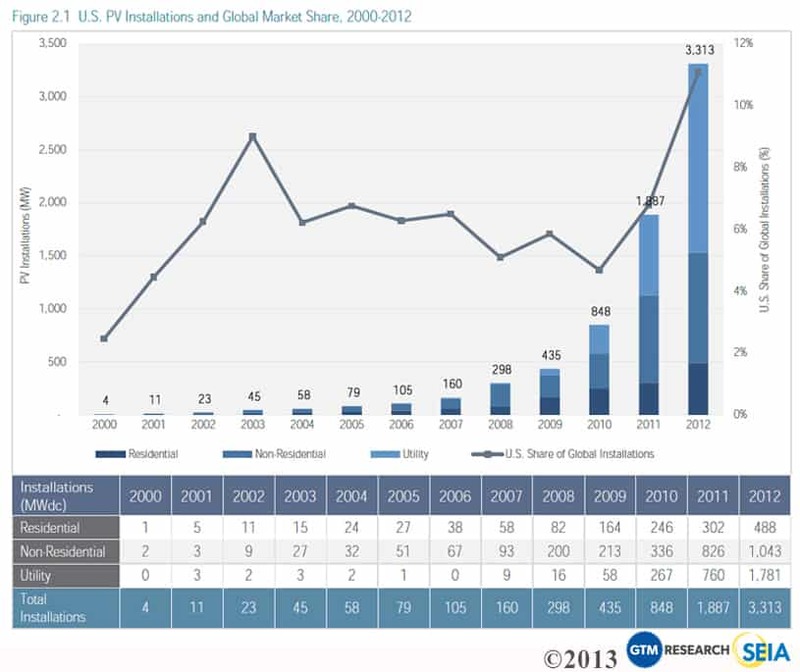 11: Percentage the U.S. represents of all global PV installations in 2012, according to the SEIA. That's the nation's largest slice of the solar pie in at least 15 years. 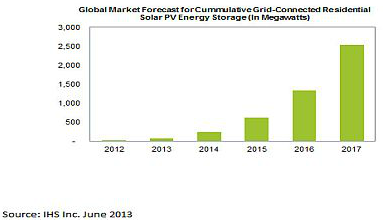 $200 million: Approximate value of global coupled solar and energy storage market in 2013, according to Lux Research. 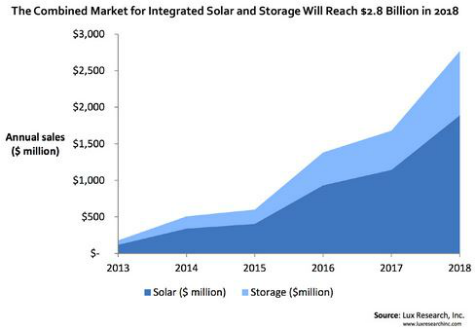 $2.8 billion: Projected value of global coupled solar and energy storage market by 2018, according to Lux Research. 12 MW: The amount of solar PV residential energy storage capacity installed globally in 2012, according to a new IHS research report. 2,500 MW: The amount of solar PV residential energy storage capacity to be installed globally by 2017, IHS projects. Would you like to see more utility and energy news like this in your inbox on a daily basis? Subscribe to our Utility Dive email newsletter! You may also want to read Utility Dive's look at whether a cyberattack could take out the U.S. power grid today.